On 1 to 3 June 2018, EisnerAmper United States hosted its annual Partner Conference for 2018 in Virginia, U.S. 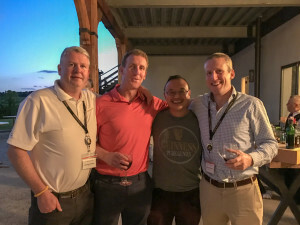 The event was attended by 200 Partners and was a great opportunity for EisnerAmper Global colleagues from the United States, Ireland, Cayman and Singapore to connect over a weekend of activities. Diarmaid O’Keeffe, EisnerAmper Ireland, Ray Kelly, EisnerAmper Ireland, Ben Leung, EisnerAmper Cayman and Alastair MacDonald, EisnerAmper Ireland at the EisnerAmper US Partner Conference in Virginia.